I cannot remember what I was looking for on Pinterest, probably dinner ideas, and stumbled upon some soap recipes. Thanks to my buddy Amy Safir, I had made laundry detergent a few times, a while ago and actually liked it. Back to the subject, so I began seeing all of these lye-free recipes and I’m like “wait what”? They still make soap with LYE? The bottles don’t say lye, I’ve never seen lye listed under the ingredients. Haven’t they found less toxic ways to make soap without using lye yet? So I begin to do a little research. Almost every site I came across says you can’t make soap without lye because it’s the chemical needed that gets the bubbles going. I’m thinking, impossible right? And honestly, who cares about the bubbles? Probably everyone, it’s a mind thing, don’t feel clean unless you see bubbles. My thought process is that if my kids want bubbles I can take them outside and blow some. Seriously, I’m sure there has to be a way to make soap, get people clean, albeit bubbleless if necessary, without the use of lye? But before going on any further about how to do that let’s talk about why when you read your soap label you don’t see the word lye anymore. It’s now hidden under the following deceptive names: caustic soda, sodium hydroxide, potassium hydroxide, and potassium carbonate. Sodium Hydroxide can be found in your drinking water, detergent, soap, and drain cleaner! Yep, drain cleaner! Lye is still being used in foods such as olives, canned mandarin oranges, hominy, lye rolls, pretzels, and ramen noodles! Of course after reading all of this we made our own soap! Our girls wanted an acoustic guitar, karaoke box for their Nabi, and a microphone. Aniyah added, “but I also need a stage”. We had been talking about building them a stage for a while but so far have now only finished 2/4 major DIY projects planned for the house. What better time to do this than Christmas! With a couple of pallets, a re-purposed cabinet and book case, some tulle, sparkle, and whimsy we were able to build them a fantastic stage and update their playroom worthy of two princess performers. Here are two Twin Tested Mother Approved very cute and very kid friendly craft ideas that your kids will get plenty of use from. The first is a larger project for moms but you’ll definitely get longevity and approval with this one! I purchased Valspar Tintable Chalkboard paint, some chair rails, & spray paint. 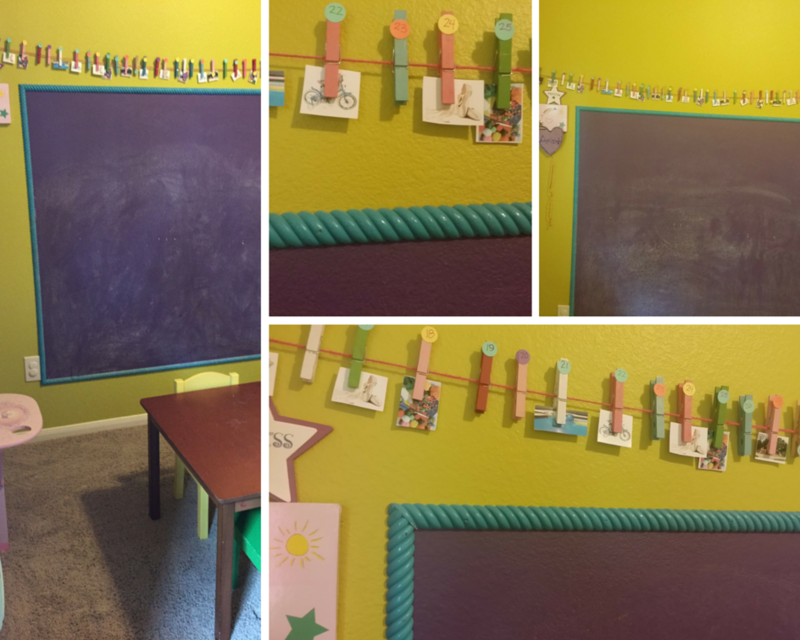 Viola, an instant stylist chalkboard to match the colors in their play room. The 2nd idea is my “Clips of Summer”. Highlight your upcoming summer vacation on clothes pin clips you make together with your kiddos capturing dates and collectibles from your travels! A great way to remind the kiddos of upcoming events and where you guys went and what you did when vacation comes to a halt!